We rely on you to make it happen! The Orianne Society is a 501(c)3 nonprofit organization that relies on your donations and memberships to achieve our on-the-ground conservation efforts for reptiles, amphibians and their habitats. Your membership means creating conservation action plans for declining species like the Eastern Diamond-backed Rattlesnake. It means planting and restoring beautiful acres of Longleaf Pine providing habitat for thousands of species. It means learning more about using environmental DNA to assess populations of Wood Turtles in the Northeast Kingdom. It means teaching a third-grader the value of reptiles and amphibians and creating a future herpetologist. It means saving a species that isn’t fuzzy or furry but that is just as important as those that are. It means saving the wild places that mean something to us. At The Orianne Society, we conduct research, on-the-ground conservation actions and outreach every day to ensure that reptiles, amphibians and the ecosystems where they occur will persist for future generations to enjoy. Whether you are a field-herping enthusiast or a researcher, whether you are involved in husbandry or are simply interested in conserving iconic ecosystems—together, we can make it happen. Become a member of The Orianne Society and be a part of saving these great species and places today. We value each and every one of our members and hope that you will continue to stand with us each year to support our conservation work for reptiles, amphibians and their ecosystems. As our work progresses, so does our need for your unwavering support to be able to expand our current projects and begin new ones that will lead us to increased success for declining species. Each year, you can renew your membership at one of our three levels. 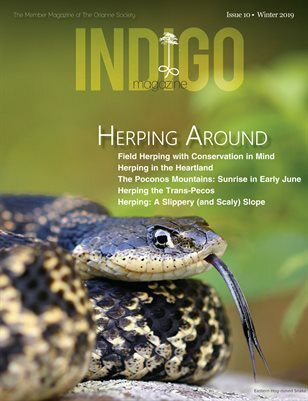 We hope you will collect our limited edition prints that feature a different focal species each year and have your Indigo Magazines mailed to you instead of purchasing hard copies online. If you are unsure of whether your membership is current, please email us at info@oriannesociety.org. But let’s face it—you aren’t becoming a member for a car decal—you are becoming a member because you care about conservation. You are the one that is going to enable us to protect these important species and majestic places.